Key Laboratory of Meat Processing and Quality Control, MOE; Key Laboratory of Meat Products Processing, MOA; Collaborative Innovation Center of Meat Production and Processing, Quality and Safety Control; National Center of Meat Quality and Safety Control; Nanjing Agricultural University, Nanjing, 210095, P.R.China. Myosin was extracted immediately from pre-rigor rabbit muscles (PRRMs) after high-pressure (HP) treatment (200 MPa, 25 °C for 15 s) to investigate the effect of pH (5.0, 5.5, 6.0, 6.5 and 7.0) on gel properties under the defined parameters. The water characteristics of the formed gel was modified as the pH altered. Improved water-holding capacity (WHC) was observed as the pH increased away from 5.5 and the highest value was reached at pH 7.0 (P<0.05). Assessment of rheological properties and secondary structures demonstrated that the thermal-induced aggregation of myosin after 50 °C was hindered at pH 6.5 and 7.0, and the unfolding of myosin conformational structures was intensified. Moreover, rapid exposure of buried amino groups in the temperature range between 40 °C and 70 °C occurred at pH 6.5 and 7.0, which contributed the formation of gel. These alternations give partial interpretation to the quality of gels obtained and verified the importance of monitoring the pH when applying HP treatment to the production of meat products. High-pressure (HP) processing has long been used in meat industry for its advantages in sterilization, enzyme inactivation and preservation of sensory attributes (colour and flavor etc.) over other traditional thermal technologies (Mújica-Paz et al., 2011). Meanwhile, its potential in modifying functional properties and altering quality traits of fresh meat and value-added products has been realized and gradually used in recent years with the development of relevant manufacturing rigs (Barbosa-Cánovas and Lelieveld 2016). Among all these traits, changes in texture and water retention abilities of HP treated meat or meat products were the most investigated ones in a previous study because of interest in using HP for quality improvement as well as yield increase (Simonin et al., 2012). Recently, most studies focused on the application of HP on post-rigor muscles instead of pre-rigor ones since a rapid pH decline would be induced in pre-rigor muscles when subjected to pressure above 200 MPa, which led to firmer texture and poor processing properties (Jung et al., 2003). Nevertheless, significant improvements in tenderness and colour stability of pre-rigor meat (pork) as well as reduced cooking losses of restructured ham after moderate pressure treatment (215 MPa, 33 °C for 15 s) were observed by Souza et al. (2011), verifying the potential of HP treatment on pre-rigor muscles under appropriate parameters. They also reported poorer texture properties and lower binding strength of HP treated ham slices than untreated ones. However, this was inconsistent with our previous work (Xue et al., 2017) as improvements in textural properties of cooked batters were observed after HP treatment (200 MPa, 25 °C for 15 or 180 s) was applied to PRRMs. The effects of HP parameters as well as animal species were considered. Furthermore, the physicochemical properties of myosin extracted from PRRMs were also modified after HP treatment. Changes in tertiary and secondary structures appear to affect the thermal-gelling behavior of myosin as well as the balance between various chemical interactions, resulting in distinctive water characteristics of the formed gel (Xue et al., 2018). Gelation properties of myosin are strongly pH-dependent as well (Sun and Holley 2011). Studies have revealed that at the isoelectric point (pI) of myosin (approximately at pH 5.4) (Huff-Lonergan and Lonergan, 2005), the net charge of protein was decreased to zero. Its solubility was minimized and myosin tended to aggregate prior to heating, which interfered with gel formation and resulted in poor gel properties (Smith 2001). Egelandsdal et al. (1986) indicated that the optimal pH for thermal gelation of myosin at low salt concentrations (<0.3 M KCl) was around pH 6. Liu et al. (2010) found that the conformational changes of myosin due to pH alternation would influence the denaturation and gelation process of myosin, which eventually brought to differences in gel properties. However, the influence of pH on the gelation properties of myosin after high-pressure treatment, to the best of our knowledge, has not yet been studied. Therefore, based on former study (Xue et al., 2017), this study aimed to investigate the effect of pH on the water characteristics of gels formed by myosin extracted from HP treated PRRMs (HP treated myosin). Also, we attempted to elucidate the underlying mechanism of these variations through changes in tertiary and secondary structures as well as rheological properties during heating from 25 °C to 85 °C. The study would provide a more holistic understanding of physicochemical effect of pH alternations on pressurized meat products, which could facilitate the broader application of HP technology. HP treatment was performed at ambient temperature (approximately 25 °C) in a 0.3 L capacity 850 Mini FoodLab high pressure vessel (Stansted Fluid Power Ltd., Stansted, UK). A propylene glycol-distilled water solution (30:70) was used as the pressure-transfer medium. According to the optimum HP parameters gained from a previous work (Xue et al., 2017), The muscle cubes were subjected to 200 MPa and dwelled for 15 s. Pre-set compression and decompression rate were 20 MPa/s and 12 MPa/s respectively. Adiabatic heating caused by pressurization resulted in rising temperature to a maximum of 30 °C. All muscles were cooled in ice after HP treatment to avoid further development into rigor state before myosin extraction. According to the protocol described by Wang et al. (2016), myosin was extracted subsequently after pressurization following the procedure of excluding water-soluble proteins (A), extracting salt-proteins (B), and purifying the crude myosin at 4 °C by repeated dissolving, precipitating and centrifugation (C). 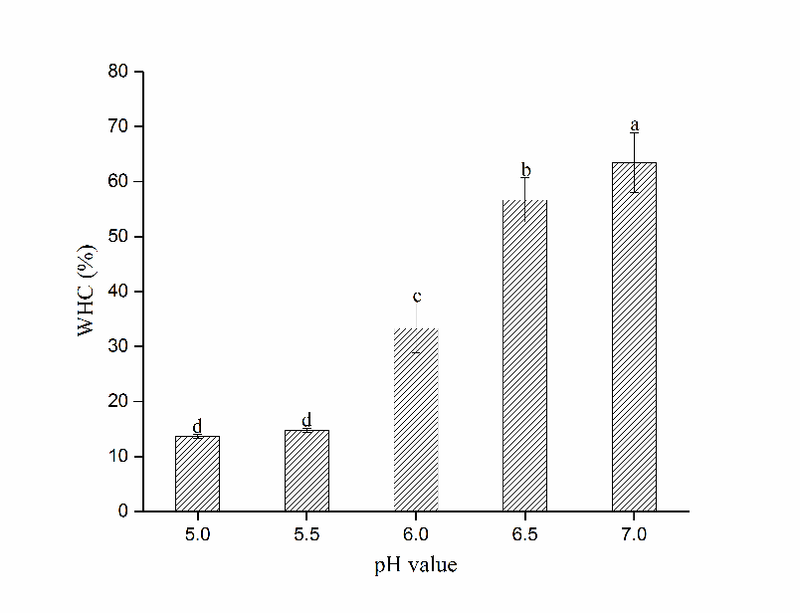 The purified myosin was dialyzed against 0.6 M KCl buffer at various pH (pH 5.0, 5.5, 6.0, 6.5 and 7.0) with dialysis bags (diameter: 36 mm, MW: 3500) for 20 h (buffer solutions were changed three times). The Biuret method was used to measure the protein concentration of myosin solution (Gornall et al., 1949), and adjustments were made with previous 0.6 M KCl buffer to meet certain requirements of the following measurements. Myosin solution (10 mg/mL, 6 mL) at each pH was placed in a 10 mL capped plastic centrifuge tube and heated in a water bath at the rate of 1 ºC/min from 20 ºC to 85 ºC and preserved at 85 ºC for 20 min to form the gel. After that it was immediately cooled in ice bath, and stored overnight at 4 ºC for WHC and low-field nuclear magnetic resonance (LF-NMR) measurements. The WHC was determined by the centrifugal method originally described by Kocher and Foegeding (1993) with some modifications. Previously formed gel (in the tube) was centrifuged at 8,000 g for 10 min at 4 ºC (Avanti J-E, Beckman Coulter, CA, USA.). The percentage of the gel’s weight retained after centrifugation relative to its initial weight was counted as the WHC. NMR relaxation measurements were performed according to the method described by Chen et al. (2016) with slight modifications. The gel sample (2.0 ± 0.1 g) was placed in a glass tube (15 mm in diameter) and inserted into the probe of a PQ001 Niumag Pulsed NMR analyzer (Niumag Electric Corporation, Shanghai, China). The spin-spin relaxation time (T2) of gel sample was measured using the τ-value of 350 μs, Data from 12,000 echoes were acquired as 32 scan repetitions with the repetition time of 7,000 ms between each scan. Two relaxation times (T2b and T21) and their proportion of corresponding peak areas (P2b and P21) were recorded. Dynamic rheological measurements were conducted with a Physica MCR 301 rheometer (Anton Paar, Graz, Austria) according to the method described by Wang et al. (2016) with slight modifications. A 50 mm parallel plate with a 0.5 mm gap was used. Approximately 3 mL of myosin solution (5 mg/mL) was evenly placed on the plate and heated at the rate of 1 ºC/min from 20 ºC to 80 ºC, A continuous 0.1 Hz oscillation and a 2% strain (within linear viscoelastic region, based on previous strain amplitude sweep) were applied to monitor the storage modulus (G′) per minute. The surface hydrophobicity was determined using 8-anilino-1-naphthalene sulphonic acid (ANS) according to the method described by Xue et al. (2017) with some modifications. Myosin solution was diluted to 1 mg/mL with 0.6 M KCl buffer at each pH. Then, 4 mL of diluted solution was added to 10-mL plastic centrifuge tubes respectively. Each pH group contained 15 samples for measurements under five certain temperatures (25, 40, 55, 70 and 85 °C). All samples were heated in a water bath at the rate of 1 °C/min from 25 °C to its desired temperatures. Certain samples were kept at desired temperature for 5 min and cooled in ice bath for 10 min afterwards. For the assay, 20 μL of ANS (15 mM in 0.1 M phosphate buffer, pH 7.0) solution was added to each sample and thoroughly stirred. After 20 min in the dark at 25 °C, the fluorescence of a 200 μL conjugate was determined at the excitation wavelength of 375 nm and the emission wavelength of 470 nm (SpectraMax M2, Molecular Devices Limited, USA). The reactive sulfhydryl (R-SH) contents were determined using 5, 5’-dithiobis-2-nitroben-zoic acid (DTNB) according to the methods described by Guo et al. (2015) with some modifications. Samples of each pH group were prepared as the same as those in surface hydrophobicity measurements. After heating, 20 μL of DTNB solution (10 mM in 0.1 M phosphate buffer, pH 7.0) was added to each tube and incubated in the dark at 4 °C for one hour. The amount of the reactive sulfhydryl groups was measured at 412 nm (SpectraMax M2, Molecular Devices Limited, USA) using the molar extinction coefficient of 13,600 M-1 cm-1. The measurement of CD spectrum was performed with a Chirascan spectropolarimeter (Applied Photophysics, Co. Ltd., UK) according to the method described by Liu et al. (2010) with some modifications. Myosin solution (0.3 mg/mL) was transferred to a quartz cell with a 0.2 cm path length. Molecular ellipticity was measured from 200 nm to 260 nm at the scan rate of 100 nm/min. The temperature was set to increase from 20 °C to 90 °C at the rate of 1 °C/min and the percentages of α-helix, β-sheet, β-turn and random coil structures at 25 °C, 40 °C, 55 °C, 70 °C and 85 °C were determined by the protein secondary structure estimation program (CDNN method) provided with the Chirascan spectropolarimeter. Statistical analysis of the results was performed using SPSS software (SPSS Inc., Ver.16, Chicago, IL), the results of WHC, LF-NMR, hydrophobicity and sulfhydryl groups were presented as means ± standard deviation (SD) and subjected to one-way analysis of variance (ANOVA) to determine the statistical difference. Significant differences between means were identified using Duncan’s multiple range test (P<0.05). All the measurements were repeated three times with triplicates in each repetition. Figure 1 reveals different WHC of gel formed by HP treated myosin at different pH. Apparently, no significant difference was found between pH 5.0 and 5.5 groups (P＞0.05), indicating minimal change in WHC near pI. While the WHC soared dramatically from 14.2% to 63.1% as pH rose from 5.5 to 7.0 (P<0.05), indicating improved water retention at neutrality, which is similar to findings in fish or porcine myosin gel (Liu et al., 2010; Liu et al., 2008). Indicating water-binding ability of proteins, the WHC of heat-induced myosin gel is closely associated with the structure of the three-dimensional network and interactions involved in gelling process (Han et al., 2014). Presumably, reduced electrostatic repulsion between myosin molecules near pI might cause aggravated structural changes before heating. Protein-protein interactions would be strengthened while protein-water interactions were weakened, which eventually resulted in poor WHC. As pH increased away from pI, intensified repulsion forces might keep the adjacent polypeptide chains detached, which enabled sufficient denaturation during heating and favoured the formation of gel matrix. Besides, more water could be filled in cavities because of the enlarged spacing between protein molecules, which resulted from electrostriction induced by pressurization (Ishizaki et al., 1995). Therefore, enhanced WHC was obtained at pH 7.0. Figure 1 Changes in WHC of gels formed by HP treated myosin at different pH (Mean ± SD, n=3). Different letters (a-d) on the bars indicate a significant difference (P<0.05). Low-field NMR technology has long been used to investigate alternations in water mobility and distribution in the material non-destructively (Han et al., 2014). In our study, spin-spin relaxation times of bound (T2b) and immobilized water (T21) and their proportion of corresponding peak areas (P2b and P21) measured on gel samples formed by HP treated myosin at different pH are shown in Table 1. Clearly, T2b and T21 barely changed from pH 5.0 to 5.5 (P>0.05), denoting rather steady water mobility near pI. However, T21 soared dramatically (P<0.05) at pH 6.0, indicating increased mobility of immobilized water as pH increased. Some researchers suggested that strengthened protein-water interactions at higher pH would lead to reduction in T21 of heat-induced gel (Bertram et al., 2006). Nevertheless, the structural changes due to pressure treatment might be varied from those induced by heating, and so were the interactions involved (Xue et al., 2017). It was possible that the immobilized water was less restricted because of the enlarged spaces within gel network, which resulted from intensified repulsion between proteins as pH increased from pI. The concurrent rise (P<0.05) of its population (P21) also proved the point as wider cavities in the network would increase the amount of immobilized water. Since early studies have confirmed the positive relationship between P21 and WHC (Stevenson et al., 2013), it is reasonable to obtain the highest WHC at pH 7.0. Different letters (a–d) indicate significant differences among the means in the same column (P<0.05). Changes in storage modulus (G′) of HP treated myosin at different pH during heating were depicted in Figure 2. Apparently, diversities in G′ occurred as pH changed. Before heating, Samples at pH 5.5 obtained the highest G′ while those at pH 7.0 had the lowest. It was likely that myosin could aggregate spontaneously without heating near pI (Fretheim et al., 1985). As temperature started to rise, marked increase in G′ occurred after 42 °C in pH 6.0, 6.5 and 7.0 samples, denoting aggregation and partial cross-linking of myosin heads. With further heating, apparent decline of G′ was observed at pH 6.5 and 7.0 after 50 °C, while constancy was reached after 45 °C in pH 6.0 samples. The distinct depression in the curve demonstrated that the denaturation extent of myosin tails increased, which broke the preliminary gel structure formerly formed (Verbeken et al., 2005).The speed of myosin aggregation is relatively lower than its denaturation at this point. This could be advantageous to the further gelation process since the unfolding of myosin conformational structures would be intensified (Xue et al., 2018), and the denatured polypeptide chains would be directed more precisely, which favoured the subsequent cross-linking between myosin tails and the formation of a more compact and organized network structure. Figure 2 Changes in storage modulus (G’) of HP treated myosin at different pH during heating. After that, G′ exhibited significant increase at pH 6.0, 6.5 and 7.0 until a plateau was reached around 75 °C, while no obvious changes happened in pH 5.0 and 5.5 samples. Perhaps the early aggregation of myosin near pI disrupted the normal order of denaturation and hindered its further gelation process. The gelling ability was reduced consequently, which was proved by their low G′ value at the end. By contrast, higher G′ was reached at higher pH while the highest G′ was obtained by pH 6.0 samples. It was possible that hydrophobic interactions and disulfide bonding was strengthened at pH 6.0, which eventually contributed to its highest G′. As reflected by the fluorescence intensity, surface hydrophobicity (H0) indicated the amount of exposed hydrophobic residues, which is critical for the aggregation of myosin (Egelandsdal et al., 1995), while the reactive sulfhydryl groups (R-SH) contribute greatly to the formation of network structure. 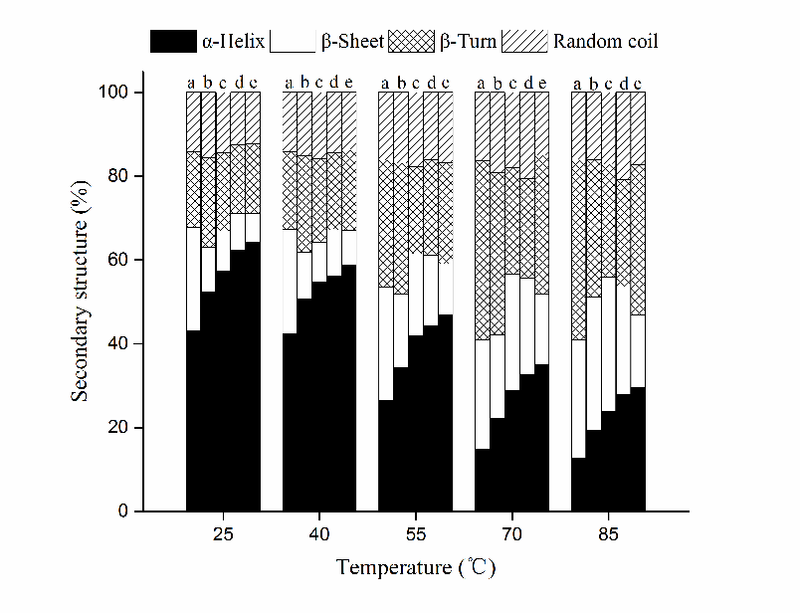 As shown in Figure 3 and Figure 4 respectively, Both H0 and R-SH of HP treated myosin exhibited different trends during heating as pH changed. Marked increase of H0 and R-SH were observed at pH 5.5 after 25 °C (P<0.05), indicating that the unfolding of myosin tertiary structures might happen without heating near pI. Thus, the buried amino groups were exposed, which led to increase in H0 and R-SH prior to others. With continuous heating, Both H0 and R-SH rose significantly in all samples (except R-SH at pH 5.0) from 40 °C to 55 °C (P<0.05), denoting intensified exposure of residues during the period. 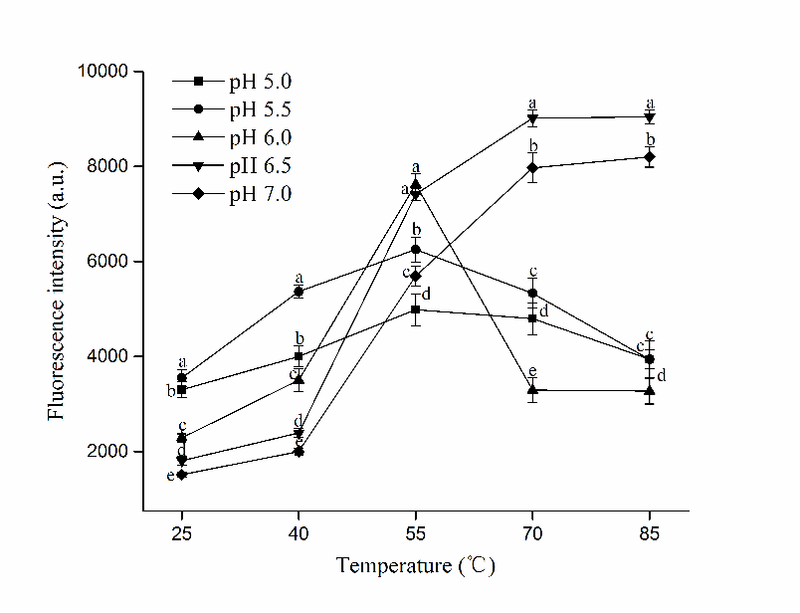 Higher ascending rate of H0 and R-SH was obtained at higher pH (6.0, 6.5 and 7.0), indicating greater extent of protein unfolding after 40 °C. While the changing rate of H0 and R-SH of myosin decreased at pH 5.0 and 5.5, which implied weakened unfolding of tertiary structures during heating. The early unfolding and aggregation of myosin before heating might be responsible for that (Wang et al., 2016). It has been proposed that better gel would be formed if the denaturation of myosin was faster than its aggregation in the heat-induced gelling process (Ferry, 1948). The fast exposure of buried amino groups during heating would facilitate the attaching of water molecules to exposed groups and promote the further gelation process by entrapping more water in the gel matrix, which might be crucial for the formation of quality gels. Figure 3 Changes in surface hydrophobicity (H0) of HP treated myosin at different pH during heating (Mean ± SD, n=3). Different letters (a-e) indicate significant difference in the same temperature level (P<0.05). Figure 4 Changes in reactive sulfhydryl groups (R-SH) of HP treated myosin at different pH during heating (Mean ± SD, n=3). Different letters (a-e) indicate significant difference in the same temperature level (P<0.05). However, a greater exposure of buried groups did not necessarily lead to superior myosin gel. 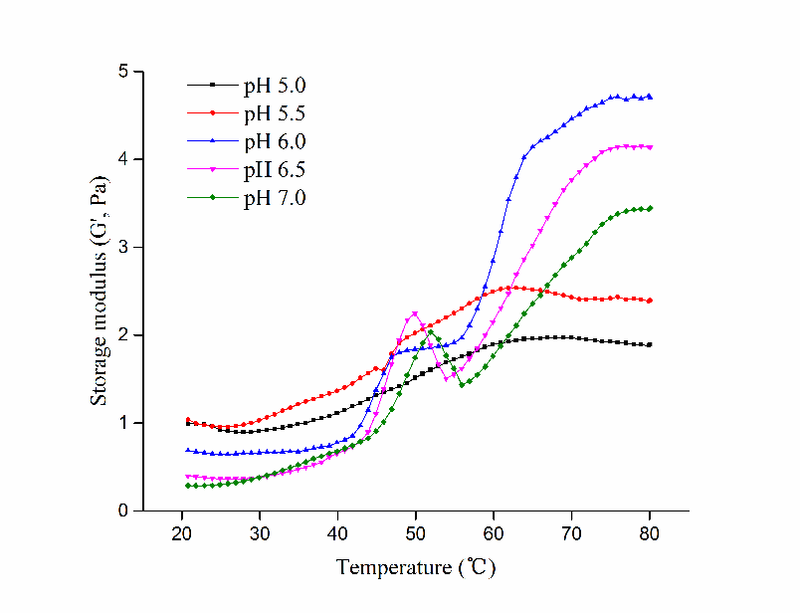 Despite the highest H0 at 55 °C was reached by pH 6.0 samples (P<0.05), abrupt decline of its H0 and R-SH occurred after that, suggesting the formation of hydrophobic interaction and disulfide bonding, which agreed with its increased G′ after 55 °C (Fig.2). The insufficient exposure might not bring adequate amount of sulfhydryl groups across the surface, also it signified aggravated aggregation of myosin at the moment, which could interfere with the formation of denser network. Moreover, the excessive exposure of hydrophobic residues at 55 °C could counteract the embedment of water molecules into gel network, and it might disrupt the balance between various forces during heating (Xue et al., 2018). These could partially explain for the lower WHC obtained at pH 6.0. As for myosin at pH 6.5 and 7.0, The H0 and R-SH rose steadily until 70 °C, at which a plateau was reached. The rapid exposure of hydrophobic and sulfhydryl groups in the middle stage of heating (40 °C～70 °C) led to increased contents of H0 and R-SH, which eventually contributed to improved gel properties. The proportion of protein secondary structures of HP treated myosin at different pH during heating was determined by circular dichroism and presented in Figure 5. Before heating (25 °C), α-helices were the predominant structure at pH 7.0, while its fraction declined from 64.1% to 42.9% as pH fell to 5.0 (P<0.05). Consequently, the contents of other secondary structures rose simultaneously. Similar phenomenon was observed in fish myosin as well (Liu et al., 2010). It was likely that both hydrogen bonds and electrostatic interactions were altered as pH changed, which affected the stability of secondary structures and resulted in a loss of α-helix structures (Xu et al., 2011). Moreover, Liu et al. (2008) reported higher α-helix contents prior to heating might have a positive effect on WHC, which is consistent with our results above. Figure 5 Changes in secondary structures of HP treated myosin at different pH during heating. Note: a, pH 5.0; b, pH 5.5; c, pH6.0; d, pH6.5; e, pH7.0. As temperature start to rise, the secondary structures at each pH went through remarkable changes since the unfolding of myosin native structures was intensified, the α-helix content decreased with concurrent increase occurred in the contents of β-sheet, β-turn and random coil (mostly β-sheets) correspondingly. The difference between α-helix content at 25 °C and 85 °C enlarged as pH rose from 5.0 to 7.0 (30.3% vs. 34.7%), suggesting increased uncoiling of myosin tails at higher pH. 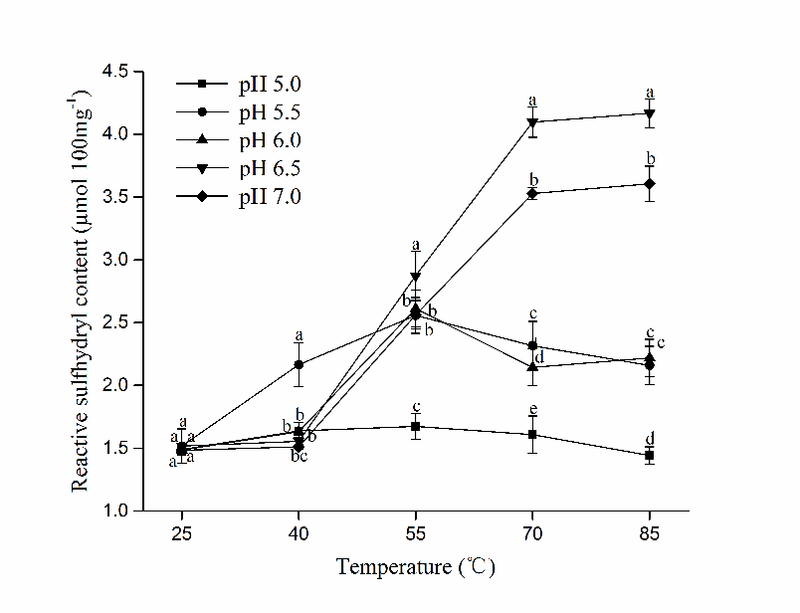 In addition, the descending rate of the α-helix content in the temperature range of 40 °C to 70 °C increased as pH rose from 5.0 to 7.0, indicating rapid conformational changes during heating at higher pH, which is similar with the changing trend of H0 and R-SH contents. Since the tertiary structures of protein were formed on the basis of secondary structures (Choi and Ma, 2007), they would both experience significant changes during heating. Based on all results above, it is postulated that the sufficient unfolding of myosin structures and rapid exposure of buried amino groups at pH 6.5 and 7.0 during heating led to further cross-linking in an orderly fashion, which facilitated the gelation process and resulted in improved water characteristics. While myosin at pH 5.0 and 5.5 tended to unfold and aggregate before heating, which interfered the subsequent thermal-induced denaturation process. Its gelling ability was weakened and gel with poor WHC was obtained consequently. Alternations in pH caused a series of modifications to the gelation properties of myosin extracted from HP treated PRRMs, resulting in changes in water characteristics of heat-induced gels. Improvements of WHC was observed as pH increased away from 5.5, with increase in both T21 and P21 occurred simultaneously. Dynamic rheological measurements revealed that distinct decline of G′ after 50 °C was showed at pH 6.5 and 7.0 while myosin at pH 5.0 and 5.5 tended to aggregate before heating. Rapid exposure of buried hydrophobic residues and sulfhydryl groups after 40 °C occurred at pH 6.5 and 7.0, whereas the increasing rate of surface hydrophobicity and R-SH contents decreased at pH 5.0 and 5.5. Changes in secondary structures indicated that the unfolding of myosin conformational structures during heating was intensified as pH increased. The increase of pH after HP treatment could facilitate the denaturation of myosin during heating, which favoured its gelation process and eventually contributed to superior water retention abilities. The optimum pH for the myosin extracted from HP treated pre-rigor rabbit muscle is pH 7.0. Therefore, pH should be monitored when HP technology is applied to pre-rigor muscles to ensure the quality of related products. This study was financially supported by the National Natural Science Foundation of China (Grant No. 31471601). Chen, X., Li, Y., Zhou, R., Liu, Z., Lu, F., Lin, H., Xu, X. and Zhou, G., 2016. L-histidine improves water retention of heat-induced gel of chicken breast myofibrillar proteins in low ionic strength solution. Int. J. Food. Sci. Tech., 51 (5): 1195-1203. Choi, S. and Ma, C., 2007. Structural characterization of globulin from common buckwheat (Fagopyrum esculentum Moench) using circular dichroism and Raman spectroscopy. Food Chem., 102 (1): 150-160. Egelandsdal, B., Fretheim, K. and Samejima, K., 1986. Dynamic rheological measurements on heat‐induced myosin gels: Effect of ionic strength, protein concentration and addition of adenosine triphosphate or pyrophosphate. J. Sci. Food. Agr., 37 (9): 915-926. Han, M., Wang, P., Xu, X. and Zhou, G., 2014. Low-field NMR study of heat-induced gelation of pork myofibrillar proteins and its relationship with microstructural characteristics. Food. Res. Int., 62: 1175-1182. Ishizaki, S., Tanaka, M., Takai, R. and Taguchi, T., 1995. Stability of Fish Myosins and Their Fragments to High Hydrostatic Pressure. Fisheries. Sci., 61: 989-992. Jung, S., Ghoul, M. and de Lamballerie-Anton, M., 2003. Influence of high pressure on the color and microbial quality of beef meat. LWT-Food Sci. Tech., 36 (6): 625-631. Kocher, P. N. and Foegeding, E. A., 1993. Microcentrifuge-Based Method for Measuring Water-Holding of Protein Gels. J. Food. Sci., 58 (5): 1040-1046. Liu, R., Zhao, S., Liu, Y., Yang, H., Xiong, S., Xie, B. and Qin, L., 2010. Effect of pH on the gel properties and secondary structure of fish myosin. Food Chem., 121 (1): 196-202. Mújica-Paz, H., Valdez-Fragoso, A., Samson, C. T., Welti-Chanes, J. and Torres, J. A., 2011. High-Pressure Processing Technologies for the Pasteurization and Sterilization of Foods. Food. Bioprocess. Tech., 4: 969-985. Simonin, H., Duranton, F. and de Lamballerie, M., 2012. New Insights into the High-Pressure Processing of Meat and Meat Products. Compr. Rev. Food. Sci. F., 11 (3): 285-306. Smith, D. M., 2001. Functional properties of muscle proteins in processed poultry products. In: Sams AR, editor. Poultry meat processing. Boca Raton, Fla.: CRC Press. Sun, X. D. and Holley, R. A., 2011. Factors Influencing Gel Formation by Myofibrillar Proteins in Muscle Foods. Compr. Rev. Food. Sci. F., 10 (1): 33-51. Wang, M., Chen, X., Zou, Y., Chen, H., Xue, S., Qian, C., Wang, P., Xu, X. and Zhou, G., 2016. High-pressure processing-induced conformational changes during heating affect water holding capacity of myosin gel. Int. J. Food. Sci. Tech., 52 (3): 724-732.